Although it can be unfair to compare a small museum’s sculpture garden to a full-blown sculpture park, arslocii holds them both up to the same standards using the same magnifying glass. 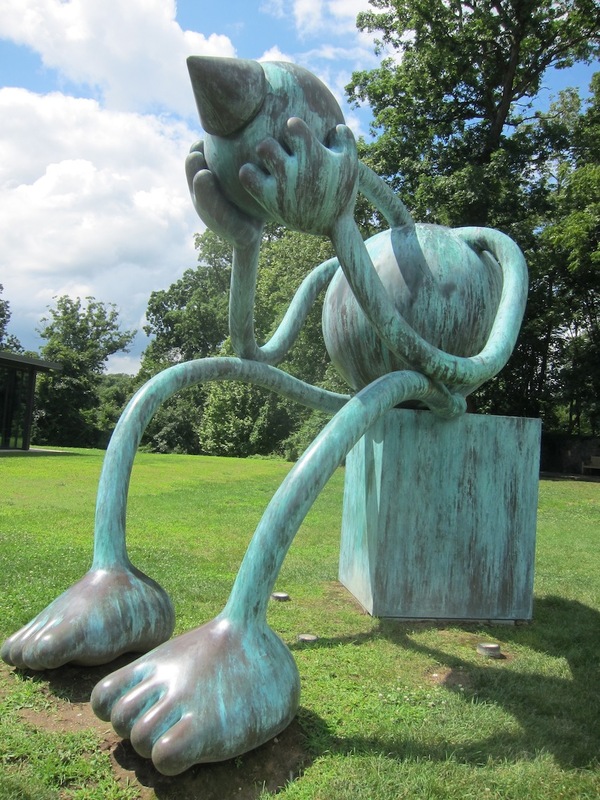 We have been to some of the big outdoor-sculpture venues, as well as some of the diminutive ones; and we are fond of any size open-air gallery where the art’s placement is considered and complemented. This week we visited the Delaware Art Museum, in Wilmington. 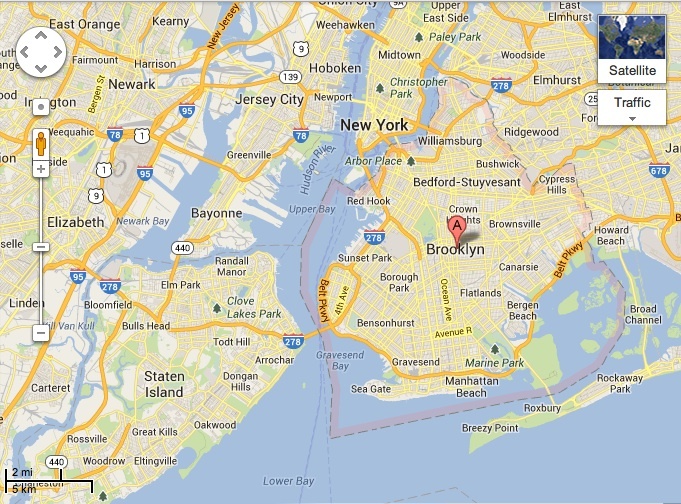 First (and Delaware is the first state), let’s say that the museum itself is situated in a rather stately neighborhood. Placeness already. 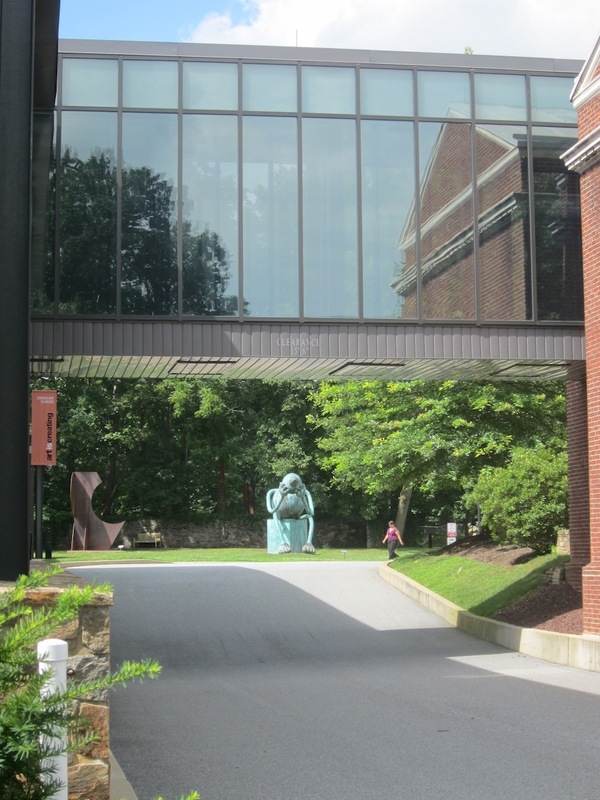 The Copeland Sculpture Garden is a slip of land behind the broad-lawned and broad museum building. At first glance the landscape seemed too shallow and uniform to allow any sort of interaction of art and site to occur. Walking through the main entrance and out the glass-walled back, across a large terrace and into the “yard” made me think that this was a private home with garden art. Maybe it once was. The difference is that what is immediately in your face is Tom Otterness’ “Crying Giant.” It is huge, 13 feet tall, resembling a cartoon version of Rodin’s “Thinker,” but is maybe a more accurate depiction of modern man. The piece is a cluster of geometric solids that has tendril arms and legs, and Mickey Mouse hands and feet. It leans head-in-hands, dunce cap on head, with painful swollen feet and seated on a large cube. For a series of balloon shapes, it is filled with angst, both comic and sad. Is it sad about the state of art? I was moved by its powerful simplicity, but then I wondered … about its placeness. Well, on one level, if it is pondering art then it is filled with arslocii. But then it is reflected so well in an all-glass modern gallery wing of the museum – a sort of looking glass for the angst of modern man. Also, when catching a glimpse of it through the connector bridge between old museum and new, it is handily framed by the architecture, making it appear much diminished and, perhaps, even more sympathetic. Down a wooded path is an interesting piece by William Freeland, “Irish Pastoral VII,” a minimalist hard edged factory made of rock and steel that felt like a tombstone. 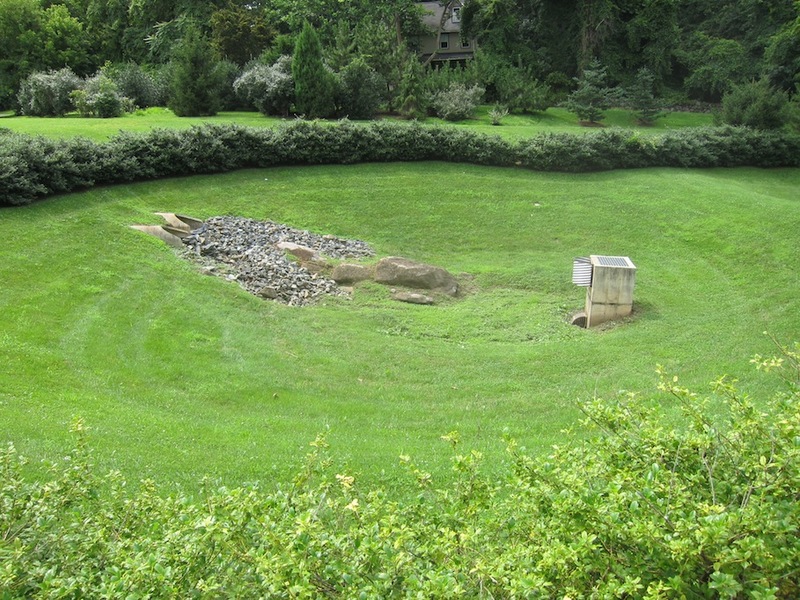 Behind it and hidden below grade is an old reservoir structure, a circular pit with stone walls that looks like a train-engine turnabout. Maybe that is because it is now a labyrinth, a spiral made of gravel and stone. That day it was set up for a wedding event and, although empty of guests, it was filled with placeness by what it was and is. 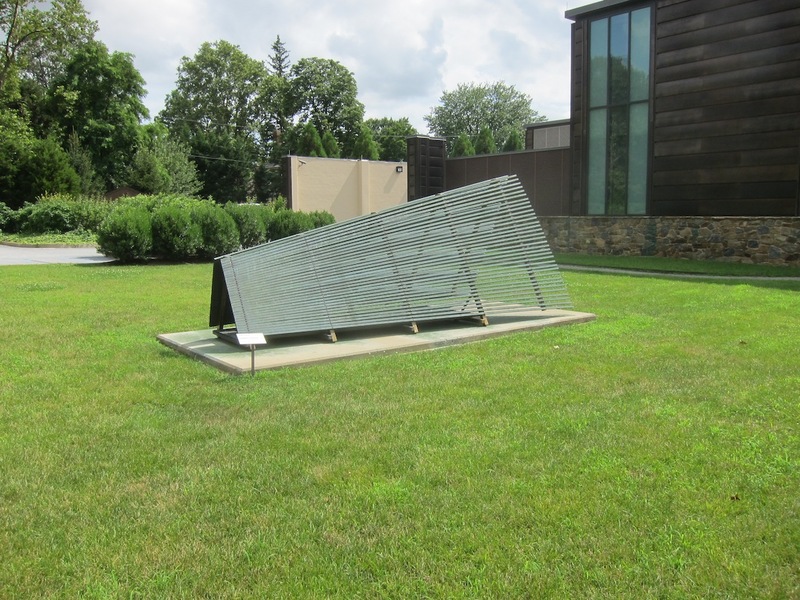 Another interesting work is Robert Stackhouse’s “Delaware Passage,” a rigorously fashioned structure of square metal tubes looking, all at once, like a railroad bridge, a brise soleil, a roof, a dock and a teepee. It plays with perspective, as it is short but endless. It is a striking piece but its placement doesn’t do it any favors. But what is this? Three large craters encircled by hedges of holly. 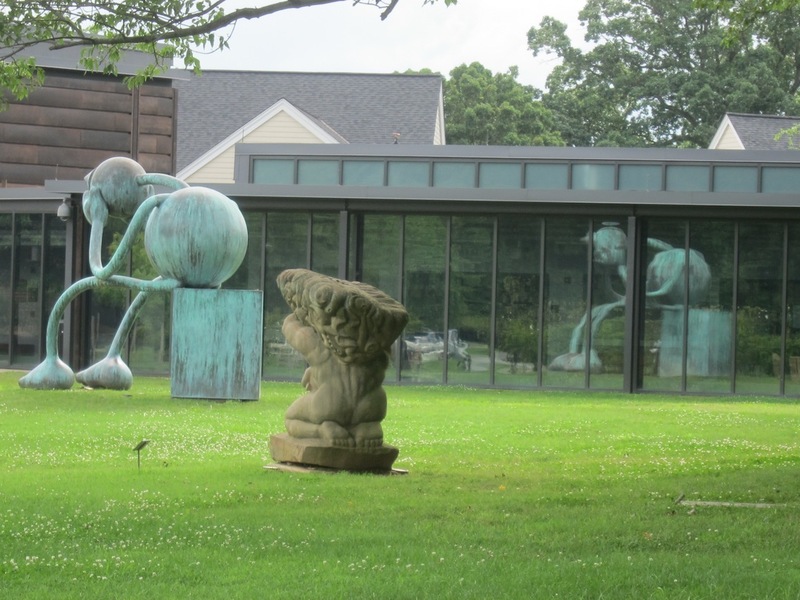 This Copeland Sculpture Garden is not a collection in which one would expect to find earthworks, but here they are. Only … what they are, in actuality, are functional drainage pits/fields. There are cascading rocks, having been intentionally (and well) placed that lead to large cast cement cubes guarded by iron grates at the bottom of the craters. They are modern and primitive, compelling and mysterious in that they are hidden by the shrubbery. But they are beautifully rendered works that are so integrated into the environment – because, unlike most of the pieces here, they are interacting with the environment. They are of the environment and, though not “art” in its narrow definition, should be considered part of the collection. Placeness is a funny thing. Sometimes you can gather together things that artists make and which are intentional works of art – and sometimes they can be very good representatives of the form – and they do nothing for you or to you or with you; they do not gain from the setting nor add to it, they do not relate to it in any way nor to the other pieces scattered about, all seemingly with the same purpose – display; all this despite the best efforts of art professionals to show off the work and make something of the place. And then, sometimes, something that is neither created to be a work of art nor is considered to be such – in fact, is hardly considered at all, except as a workaday intruder in the garden – can have such power or attraction or even a compellingly formal nature that it not only challenges your conception of the art and its definition, but makes the o better and the place perfectly contains it, as if it were prepared thoughtfully to do so. 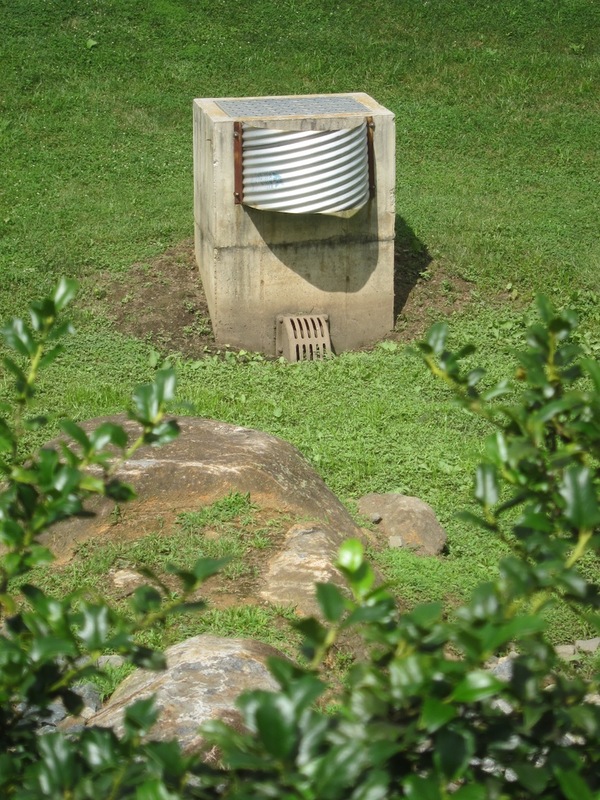 A rocky sluice designed to channel water runoff away from the art and into a drain can, somehow, wonderfully, become the centerpiece of the sculpture array – a questioning of the need for intention as a component of art. Arslocii can materialize from something functional as well as something artful, being the product of one or both at the same time. It just happens, and just is. Arslocii. Air conditioning has never held a place in my life. The only mechanical cooling devices that I have used are electric fans. My father was a mathematician and electrical engineer, and he therefore understood the physics and practicality of products with cords. He would place fans in strategic locations around the house: one was attached across the opening of the attic’s hatch in the ceiling – to draw the hot air up and out through the roof vents; another would be placed in a doorway on the floor to push the warm air up above our heads; others would be set in windows, either blowing in or out, depending on which side of the house. There was an intelligent logic about air masses and air flow that he demonstrated by these placed fans. He never aimed a fan to blow directly on him, though; that might have been more of a superstition than an educated decision. 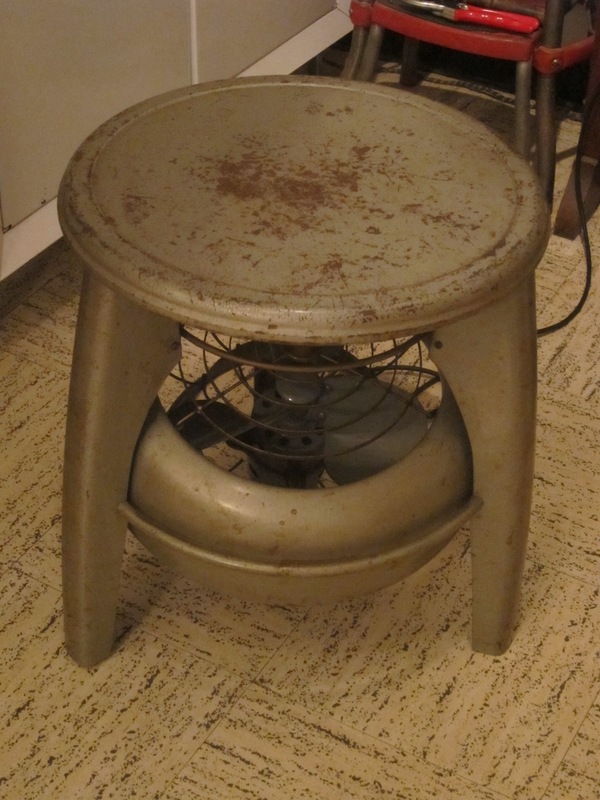 Aside from the rather extensive collection of fan brands and types – oscillating, box, table, window and hassock, with their big electric motor company logos – I became enamored of their look and style as much as their function. By osmosis, I learned about moving air in a meaningful way. As a pre-teen, whenever I would be blue or upset I would take walks; on one such walk I found a fan in a weedy empty lot. I brought it home and Dad helped me to rewire it. It was a prize. 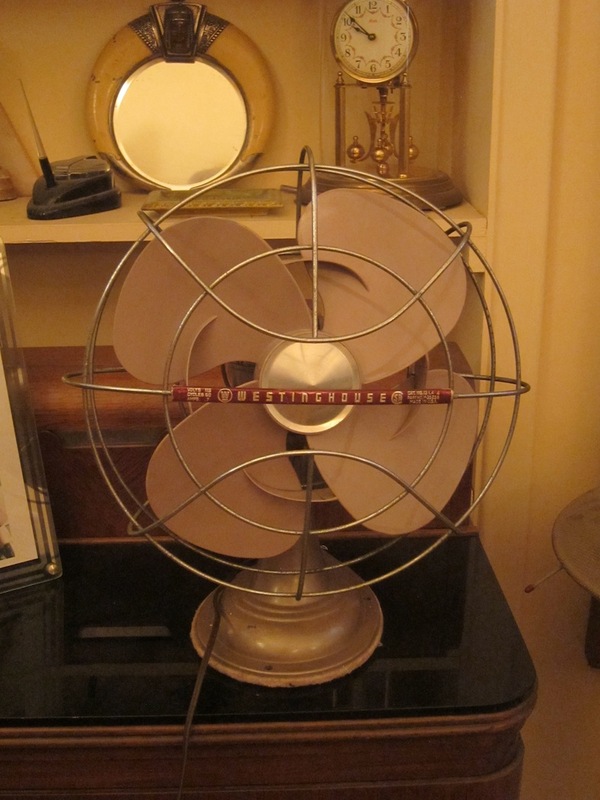 When, as a young adult, an older relative was downsizing and I spied a huge window fan in the “out” pile, I grabbed it like it was the most valued object in the house. Well, to me it was. Many more old electric fans have come to me at yard sales, flea markets and from other family members. At last count, I have four large window fans, five floor fans, five table fans and two fans on stands. They are much loved and oiled on a regular basis. You could say I am a fan fan. What is it about them? Well, of course, their connection to my father. But they are often round and I like round things; and even if their casing is square they have a round soul or face. The electric whirr of the motors is soothing, and maybe one day someone will discover that it taps into your alpha brain waves in the same way that biofeedback did back in the day. They do actually cool you in the heat, too. 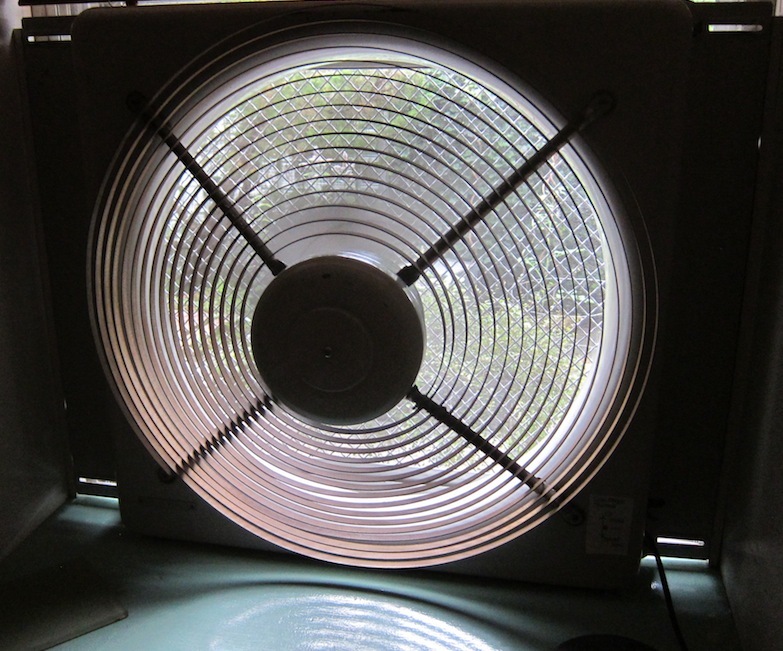 I close things up during the hottest part of the day, then I either draw basement air up into the first floor with a window fan; or I pull cooler night air in through the open windows, and by morning you might need a blanket. In my house there is an attic fan, but, as opposed to my father’s scheme, it doesn’t pull hot air from the house; rather, it is solely for evacuating the trapped hot air from the attic. It does have a similar effect of cooling the house, just not as directly. Anything that has electricity and moves has a life to it. Fans have the added bonus of providing a service, doing something helpful and immediate to cooling our world – without collecting and adding more heat in the process like air conditioning. Buildings shut themselves off, cars are closed up tight with chilled air – chilled air in an unbreathing room belching out hot air for the rest of us. Why aren’t fans good enough anymore? We have made a move on wind power and capturing the energy that it produces. Fans have been using the energy to cool us by evaporation for as long as electricity has been available. It is sad that the fan – so simple, so effective, so versatile – is in decline in our Air-Conditioner Nation. Take a walk, as I used to, and you’ll see, especially on trash day, fans kicked to the curb, unwanted, dismissed from duty. And, often, they are still good. Within the past few months I have found two in someone’s discard pile, took them home, plugged them in – and they worked like charms. In fact, they are charming, in all senses of the word. 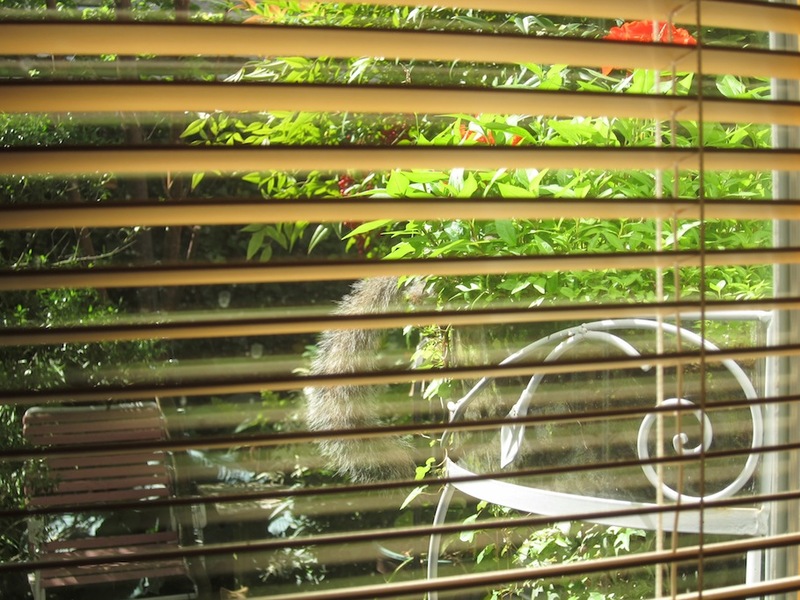 In your window, on a table, on the floor, they hum away, pushing air around in the kindest of ways, letting you look through their grill-work to see the blur of their busy blades and views of what’s behind and beyond. An air conditioner merely sits there, a big, personality-less block, like the Borg ship, separating you from the world at large. A fan lends an air of placeness to even the grimmest of rooms; an air conditioner removes placeness, the way it removes heated air, from even the nicest of surroundings. A fan is like a pet; an air conditioner is like a security guard. You don’t have to be the coolest thing to be the coolest thing. Suddenly I find myself in a sea of rubber bands. Squirmy mounds of bands of varying thickness and lengths sit in a bowl like clusters of rainbow-colored seaweed. They are everywhere. Wasn’t there a time when they nearly disappeared? I am remembering a while ago, maybe the later half of the 20th century, when they weren’t being used as much in offices, schools and homes as they once were. My fascination with rubber bands started early. I always liked the friendly nature of their form and substance. First, they are round in a predominately square world. But they are shape-shifters, too. Their diameters vary, as do their widths and thicknesses and colors; I have seen some as tiny as a half-inch in total or nearly as long as my forearm. They seem to be one of the longer-lasting, unsung, amazing albeit small, ubiquitous products of the 20th century, after having been patented in the 19th. But the patent is a johnny-come-lately; as states a Wikipedia entry, “Mesoamerican peoples had already produced vulcanized rubber items, including rubber bands, by 1600 BCE.” They did, after all, have the rubber trees within reach. Lately, I find them everywhere. Our mailman uses them (the large industrial tan or natural-color ones) to bind together individual households’ mail. As he makes his deliveries, he drops the rubber bands on the ground. Not environmentally sound thinking, but you could probably follow his trail of rubber bands to learn his mail route. I also have noticed that much of the produce I buy is bunched in rubber bands: wide purple or yellow ones, thinner blue ones wrapped multiple times. Some leafy greens still employ large-scale twist-ties – like regular ties on steroids – but many more bunches of vegetable matter, whether shipped in or locally grown, are sporting festive rubber bands. I have such a large collection of them now, I feel that someone ought to figure out another purpose for them. I do reuse some and I have learned a few things indirectly about their properties and uses, slingshots aside. 1. They don’t freeze well. In a freezer, the rubber fails, dries out, becomes inelastic. 2. They can be cheap, attractive bracelets but they should be loose on your arm. 3. Things that aren’t too thick and you can roll up, like blueprints and maps, are perfectly suited to rubber bands to hold them steady. Eventually, they will dry out and loosen. 4. If you are a jerk and want to annoy someone, you can shoot rubber bands in his/her direction – but avoid the eyes. 5. They are a good way to hold wound-up electrical cords together, when a twist-tie just won’t handle it (unless you happen to have saved one of the huge ones from produce). 6. They are not good to pick up in a vacuum cleaner, and happily, it is difficult to do so. Somehow, their lack of substance and friction-y surface help to discourage that. 7. They are miracle healers. If they break – unlike so many other binding technologies – all you have to do is tie the ends together and there you go again … a little smaller, perhaps, and a tad more fragile, but usable. A second life. 8. There are so many ways to store rubber bands: in a box or envelope or any containing vessel, in baskets (as we do), on long rods either sticking up from a desk or out from vertical surface. 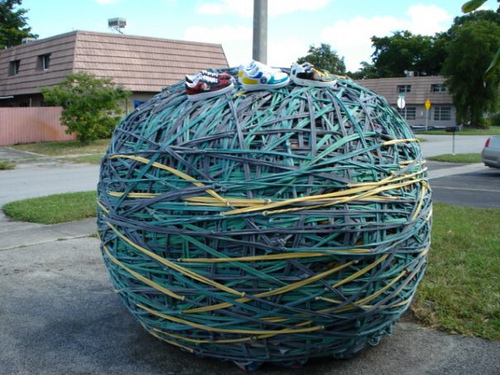 One can even keep rubber bands rolled up in a ball. Indeed, there are those for whom this is not just a practical thing but a hobby or work of art. 9. In an irony not lost on the consortium of rubber-band producers (there must be some such organization somewhere), rubber bands have supplanted the fuzzy, slightly elastic, so-called “stocking tops” as the binder of choice for home-delivered newspapers … just as newspapers are taking a nosedive into oblivion. Millions of such band/paper pairings occur, still, to this day, every year..
10. A rubber band can be a terrifically annoying, almost non-musical musical instrument. Stretch, pluck – twang/plunk. Over and over. 11. Without a rubber band, there would be no paddle-ball. From one’s personal perspective, this is either a benefit or an indictment. 12. Unlike paper clips, staples, paper clasps and other such metallic binding products, a box of rubber bands if accidentally dumped on the floor will not make a sound that will draw the attention of the person whose desk you have raided to “borrow” such items. 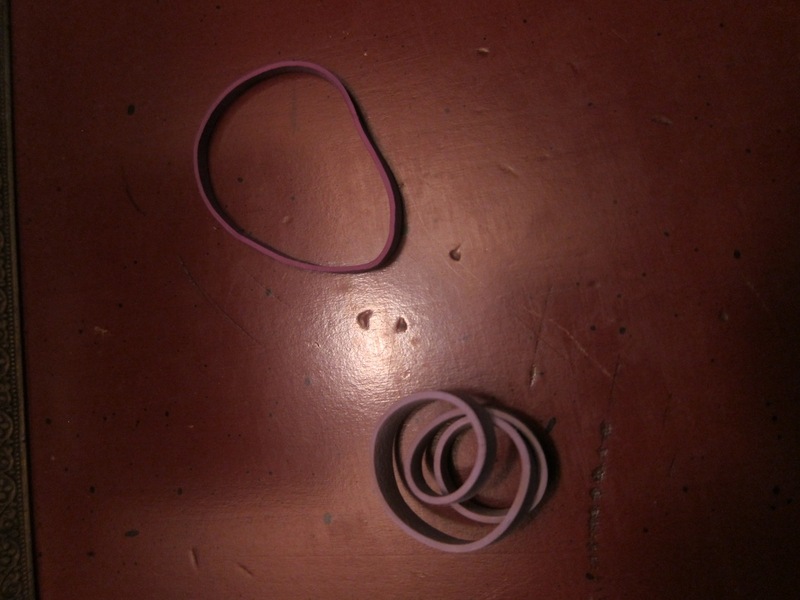 Rubber bands are willfully complicit in all crimes. 13. They may be soft, bendable, twistable, squeezable, roll-up-able – and, yet, they can really sting when you’ve had one snap against your skin. And as easily breakable as they are, put them in the array of braces on your teeth, and they not only have the strength to reduce an overbite but can also cause a great amount of soreness and pain and headache, not to mention embarrassment. All from those tiniest of rubbery squiggles. 14. Keep them away from animals; they have appeal to all creatures and you don’t want any to end up in a digestive tract. 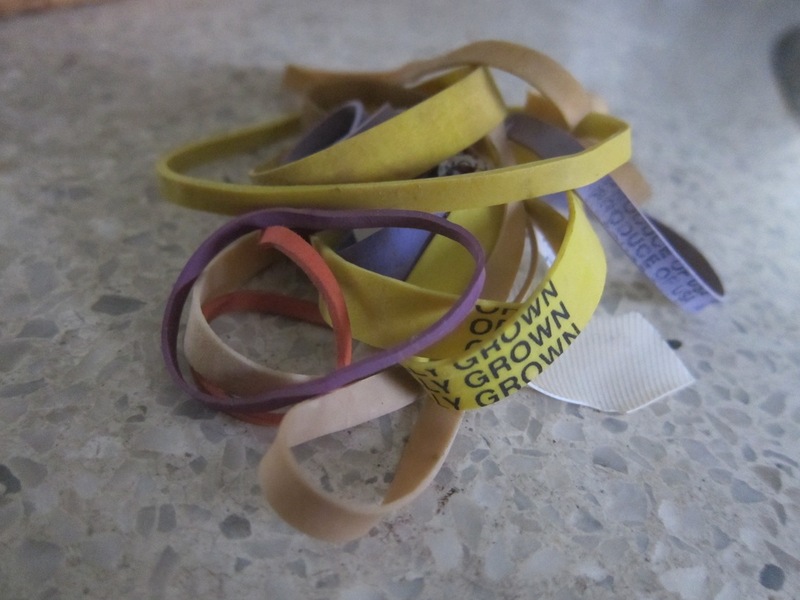 Rubber bands are, at this point, part of our genetic make-up. They are without affect or personality but there is a placeness to their presence in our everyday world, and by their very nature, functionally, they create placeness by limiting and encircling and defining, determinedly and yet forgivingly. If they were not around, it would be a harsh and rigid place with only paper clips, staples, clasps and the unyielding like. There is an art to cities – in the way they are planned, in the way they are built, in the manner in which they develop both intentionally and organically, in the way they respond to unexpected internal and external forces, in the way they confront and respond to age, in the way in which the residents live their lives in relation to these urban plans, changes and vagaries. Some cities become fine works of art, others do not; some become both, consecutively, alternately, moving forward or backward, often repeatedly so, as the fates, citizenry and city fathers allow. The art-ness of cities is fluid, and can vary from block to block, decade to decade, administration to administration. It is hard to tell if Philadelphia is a work of art now, on the way up or the way down. For the most part, its central core has seen much construction and advance, and especially impressive and comforting growth of those things that attract tourists, young people and empty nesters: music, theater, museums and galleries, restaurants and shopping. It benefits from the great number of single-family homes and apartments right in the heart of the Center City area and immediate in-city surrounding neighborhoods; it is a place that never has suffered that deadness of a downtown that empties after work hours. There seem to be a lot of bars and bistros feeding off the disposable income or the credit-card debt of hordes of twenty- and thirtysomethings, as well as Boomers and expense-accounters. It is also a city of staggering poverty, of disturbing and frequent violent crime, of acres of empty lots and decrepit housing in rundown sections out of sight of the more bustling and cosmopolitan center. There is the natural tension where the two worlds of Philadelphia – the poor and the better-off – meet, along borders, in rapidly gentrifying areas, pushing the edge of the inner edge city, where abandoned factories and remarkably cheap housing entice artists and pioneers and the brave, threatening the turf and tax bills of the longtimers. There are also places in the downtown area where that poverty and decline pop up and encamp, as a sort of movable blight, creating surprising and dismaying stage sets in a kind of street-theater conceptual art that lacks aesthetics but instead is deadly serious doings. Market Street is one of those stretches. 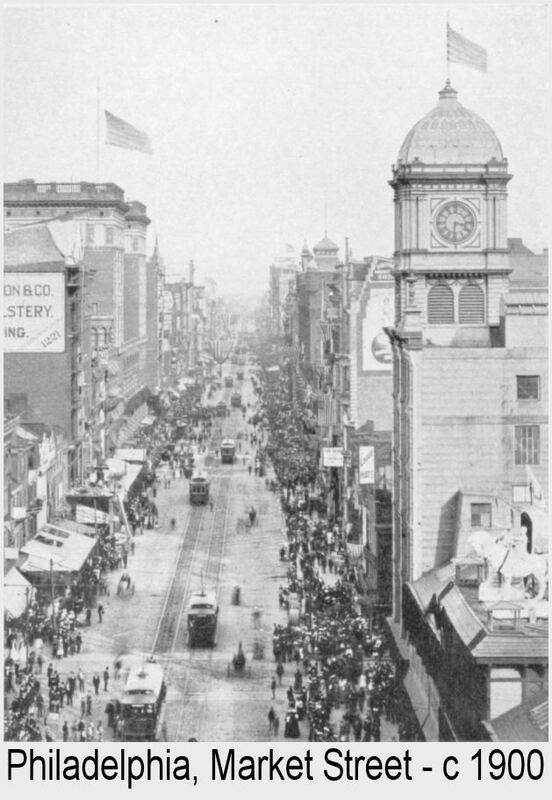 As one could safely guess, Market Street – or what has now been labeled as Market East – has been a commercial corridor at least from the time of Philadelphia’s earliest settlers, as their ships docked along the Delaware River shore and unloaded merchandise, which was then distributed on carts and in shops popping up and moving westward from the water, following the spreading population. Within living memory, the seven blocks of Market between 7th Street and City Hall were home to seven department stores, as well as dozens of shops of all sorts. Market was never the fanciest shopping street – parts of Walnut were more high-tone, sections of Locust were oddly exclusive – but it drew customers, and it was a family strolling street, going from Wanamaker’s to Snellenburg’s, Gimbel’s to Lit’s, Howard’s to Robinson’s, and to Strawbridge & Clothier. It was a street of rites of passage and city lore: here is where hundreds of thousands of Philadelphians went to see Santa, where they had their first grown-up restaurant meal, where they would go to the Grand Court at Wanamaker’s and hear the daily pipe-organ concerts and meet at the Eagle. It was more than a shopping street, or a destination – it was the stage set, a place of memories and where one became part of the great continuity that is city life. 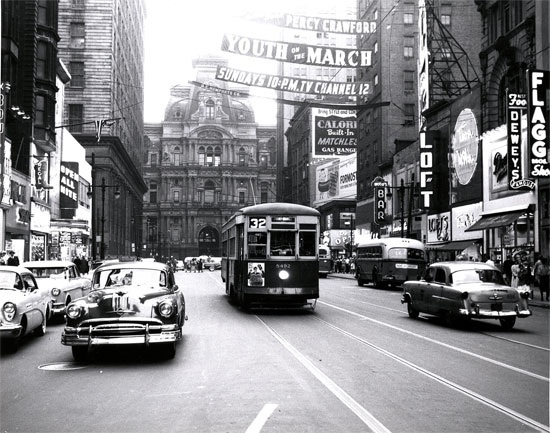 Starting around the Sixties, Market Street began to change noticeably. The better stores disappeared, to be filled with t-shirt and sneaker shops, and low-end retail; whole rows of stores were demolished to make way for office buildings and parking garages. Lately a convention hotel has been built, and a landmark high rise has been converted into a hotel, as well. Stores vanished when the idea for an in-town mall came to fruition, and the Gallery – appropriately named, in this discussion about art and the city – like malls everywhere, became a big-box magnet and category killer. There are amenities for tourists and conventioneers, but not many. And where once there were seven department stores, now there is one. It has gone through three name changes and, as a Macy’s, no longer has any hometown lineage, and except for the organ and eagle, no local DNA. Snellenburg’s died and departed long ago, as did Robinson’s and Howard’s; Gimbel’s has been a street-level parking lot for decades, and the site of dashed developers’ dreams for just as long. Strawbridge’s and Lit’s have been converted into office buildings, with a smattering of retail at ground level. For one who works in one of those buildings and who exits onto Market Street five days a week when the sun is similarly making its exit, the art of the city is difficult to interpret, and certainly to appreciate. The street surface is filthy, foul odors emanate from a sewer system overtaxed by the flushings of shoulder-to-shoulder multi-story buildings, a deadening darkness pervades the streetscape as shops – those that are not vacant – close early or roll down their metal grates over the windows of their unlighted businesses. It is by no means “Blade Runner” but it is a vista that resonates with several layers of failure and many more layers of tolerance for what should be intolerable. So much for the set ­- now for the actors. A walk up Market Street more and more seems like a stroll down a byway in a third-world country, with the lame and beggars lined up, trying to snag some change from passing tourists and dayworkers headed home. These are people in dire shape and straits, and they are not to be ignored; but, not too long ago, there was a campaign by a local group with the poster tag-line, “The more you give change, the more things stay the same,” and that is the philosophy we follow. But we all play our roles: they ask, we politely decline, and that’s that. Some passersby behave as if these people do not exist, not acknowledging their presence. Very few of us actually give, and these are often visitors from other countries. But there is almost a dance of request and rejection, and both sides know their lines and, really, know how the scene will end. Indeed, some of the panhandlers ask for things – a dime for a meal, a quarter for coffee or a bus ticket – that are so patently ridiculous on the face of them that they are bound to lead to the failure that is predetermined even if their “pitch” were better. But there is, in that walk up Market, an element of danger, of some fear, of the possibility of a confrontation or an accusation, and then violence. Market Street, once a benign place of commerce – not the city’s liveliest, or best, but certainly one of its most solid – has become emblematic of a changing urban “theater,” one we no longer wish to be in the audience of. We all, in the city, put up with too much to get what we think we need. When one no longer gets that, nor gets it in a way that is satisfactory – when one realizes that there is no reason to put up with so much unpleasantness, that one no longer wants to take it anymore, that what we believed to be the city’s placeness is mutated or gone completely – then it is time to say that this city as art is no longer to our taste, and that it’s time to direct our gaze elsewhere. We all are creatures of schedules, whether by adhering to them or ignoring them, purposefully or by perverse nature or by mindlessness. Some of us couldn’t function without them; others resent them; for many of us, it is both. Still others pretend that they live without any schedule at all. 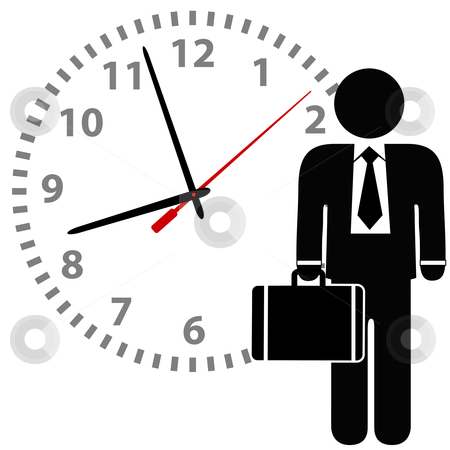 The typical time frame in the so-called work world is 9 to 5, give or take an hour on either end, but in this 24/7, internationally plugged-in life cycle we find ourselves in, work can commence at any hour, and in so doing the “ordinary” world seems to lurch – they don’t call it a “shift” for nothing. And pity those whose shifts vary, regularly or otherwise, such as police officers and firefighters, who might have long days followed by short days followed by days off, and a change in hours, as well. This spreads out decent schedules and terrible ones in an equitable sharing, but it has to wreak havoc on their sleep patterns, not to mention their personal lives. We here at arslocii are people who, over the years, have had less scheduling than most. 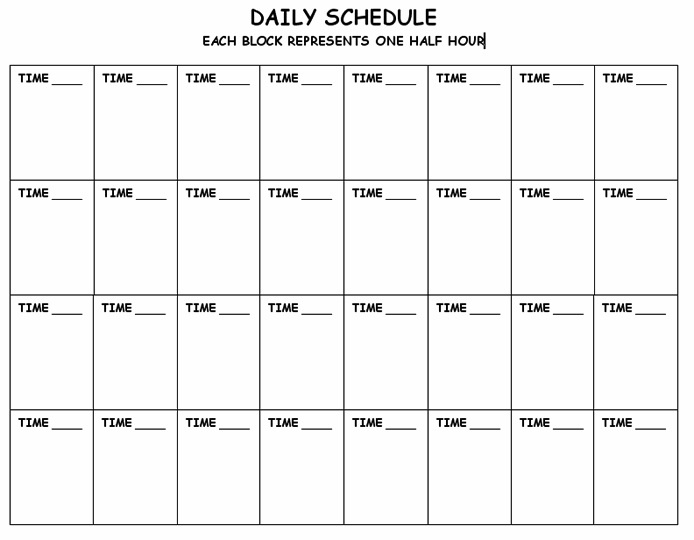 Some might call it “underemployment.” But, when you work for yourself you have to create your own schedule, and that can be difficult for many, impossible for others. Freedom requires discipline. Change being the only unchanging certainty, we, though free spirits that we are, have found ourselves for more than a decade as someone else’s employee, on someone else’s clock. Not that this was a new concept – we’ve had lots of jobs – but, rather, a bullet we had dodged for a while. 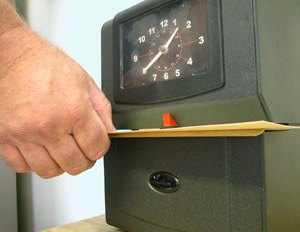 And, maybe because of that avoidance, in some sort of karmic payback we ended up having to design our lives around a 4 p.m to midnight work-time slot. What that meant was that we had part or most of the daylight hours to attend to stuff of our own and had to “time-shift” what we would normally do in the late afternoon until after the witching hour because the real hours belonged to an employer. Once you get used to the rhythm, it isn’t so bad. But, because of the schedule, our dinner time was around 3 in the afternoon. Again, you can get used to it. So we did. We got pretty good at it, in fact. It got to feel like normal. We wondered how others could survive on those horrible 9-to-5 work-release sentences. Other than realizing that the world’s insistence on stupid, standardized work hours meant that we could no longer attend evening socializing of any sort, we felt that we had the best of all possible worlds – except the one where you don’t work for anyone else … or work at all. In the midst of this upheaval, though, we have found something that we didn’t expect: a renewed sense of placeness. When you go to work to the same place at the same time with the same people every day, you cease to notice any of it, and you come to believe that that is all there is to the place of work and the tasks you and others do. Then, you find yourself coming in at a different time, and the workplace seems something new, even alien. Whereas before, on a later shift, we would come in just as the day-crowd was leaving, and all we knew of them was the transitional passing off of information, chitchat and uncompleted work. They were them; we were us. Eloi and Morlocks. As different, in a real sense, as day and night. But now we are among the day people, and the room that is, at night, quite empty is, when the sun shines, a lively place full of workers who, until now, were just shadows who left their stuff for my group to tidy up and send on its way. What you see, what you sense, is that a workplace, one with numerous shifts that go on around the clock, is like a theater that never closes, and that you used to think that the production – comedy? tragedy? – began and ended with your entrances and exits and lines, but now you realize that the show was going on before you arrived and continues after you leave, that work life is like this endless ribbon that you are merely a snippet of cut off at random lengths, and that the place hums to more tunes than you ever imagined. It’s a new script, but somehow you know your lines and the choreography; it’s a familiar set, yet something is different enough to make you think that you missed the memo and a few dress rehearsals, and it makes you aware, perhaps for the first time, or for the first time in a long time, of the artificiality of it all – that offices and factory floors are like Potemkin villages to which you grant the gift of reality, whatever that is, so that you can do what you have to do and believe in it. So, from a simple rejiggering of when you show up for work, what you might come away with is the knowledge that, in all other things in your life you believe yourself to be the star of your own movie, but here you are but a member – perhaps even just in the chorus – of a large and revolving cast, and that the “set” has a lot more storyline outside your own than you ever thought. And somehow, somewhere in there, there is art. As creatures of habit, once we establish ourselves, we find our favorite routes to and from. Some of us never vary our paths; others are more experimental in mixing it up a bit, for variety’s sake. I once worked with a guy who had his routes, by car, so mapped out that he knew exactly how long each one would take: 7 minutes and 32.5 seconds – yes, that precise, and he loved to offer his statistics. Kind of scary. Another factor that determines my paths is a sense of comfort with the terrain. I just don’t feel safe in multilane highways that slice through undeveloped parcels and give the traveler no sense of context, let alone placeness. It can be like a big, open-range cattle-herding chute, in stampede mode. We have way too many of these behemoth roadways and they disconnect people from places. It is an earthbound version of the “fly-over,” which is how all of America between the east and west coasts is referred to by east- and west-coasters. We have set up thousands of miles of “drive-over or -through” zones. I consider these avoidance paths. I am a map person – I know that that places me somewhere in the pre-Holocene epoch – and loving the in-hand maps includes the wow factor of the mind-blowing concept that crazy/brave explorers mapped out our world, long before GPS appeared. I not only value what they did but I cherish what they left for us. Maps are wonders of the world – how were they designed, conceived and realized? I have seen some of Lewis and Clark’s first renderings of the Mason-Dixon line. Did they find a path or did they make one? Native Americans followed deer paths and Lewis and Clark followed Native Americans. Now we follow road engineers who don’t believe that the land knows best – they just cut down anything in the way; and it never ends up being a straight line anyway. I admit I don’t warm to GPS or even to Internet mapping programs because they lack context. There is no where there. Certainly I can follow directions, although they are not always accurate. Instead of beaming in on the micro, a real map will give you the whole picture, and then you can find the specifics. 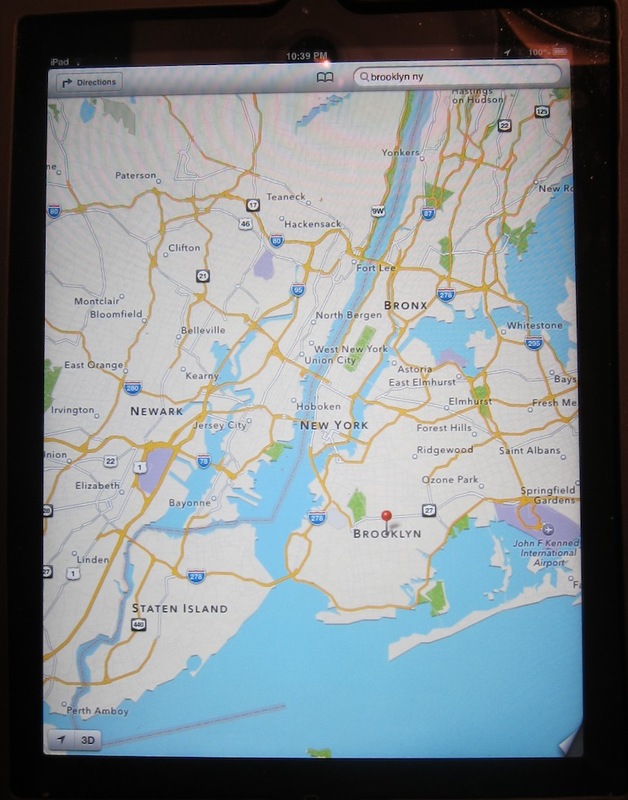 On a device, you have a very narrow window through which to view your options. If you move out, the detail is lost, street names disappear; move in and you are a dot with maybe three lines surrounding you. With a map, you have an entire region and you can maneuver through it in different ways. And you will probably learn things along the way, as opposed to accepting and following one way. 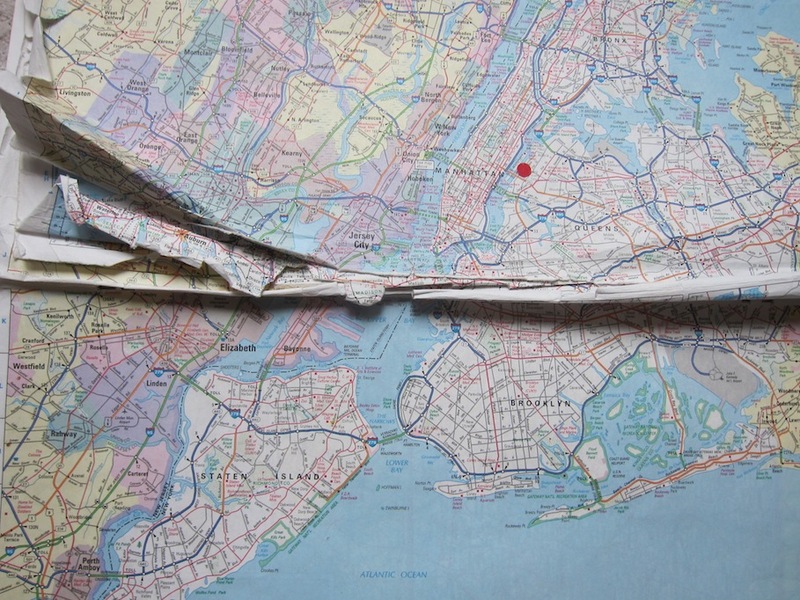 Sometimes getting lost with a map in hand can be challenging or exhilarating, since it offers you options for self-correcting. I always feel safer with a map nearby, it is a guidebook to the ground. And as long as we are grounded, it is useful, necessary. Recently, relying on a web-based mapping program in a rural area – it, sadly, was the only option (well, there’s one point for the electronic version) – but it mapped the wrong address on the wrong road, and had its little pointer pointing to the end of the road for the destination. Strangely, the real road continued on despite the virtual road having ended, but the blinking dot (meaning my car) just kept moving along the empty space of non-existent road on the virtual map. Talk about scary. The road ends/it doesn’t end and the virtual car has found the other side of the looking glass. It was the cellphone to the rescue, in this instance. Yes, it is miraculous and bizarre, and a bit scary, that a satellite can find you and follow you – yet, apparently it doesn’t care where you are. But think about the miraculousness of a piece of paper that a) someone created, b) after someone trekked, c) after someone measured in distance and contour: mountains, rivers, oceans, roads, and drew it all in an organized system of scale. Look at a real map and find those squiggly lines that snake up a mountain or alongside a creek. That’s the path I want to take, in this case not a straight line but as straight a line as nature provides, the contours of the land molded by wind and water. If we follow such paths, who knows where they might lead? Who’s That Nut-Nut-Nut-ing at My Door? I like to think that I can communicate with non-human animals. I don’t eat them, and maybe that gives me an edge, since they can smell it on us. Or, maybe I am just open to other creatures, so it happens. Yes, I have opposable thumbs – big deal – I don’t think that is the only meaningful attribute in the universe. 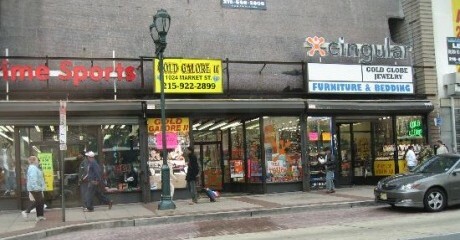 Many years ago, we were living in Allentown, Pa., in the upper two floors of an old Victorian twin. The house sat at the top of a big hill with amazing views west, a precarious and exciting spot for watching thunderstorms roll in. The yard swept steeply downhill and, because of its pitch, stayed as a rather wild area. There were many small animals that made their homes on that hillside. I watched their daily patterns as they grazed about in the late afternoon: rabbits, squirrels, woodchucks, chipmunks and birds. There were times when I witnessed bunnies playing leapfrog in the grass, just as frolic-y and fun-loving as squirrels. I would sometimes sit in the yard and watch them as if it were a scheduled performance, one I would have gladly paid to see. So on one of those occasions, as I was sitting in the grass, the entire community of small mammals showed up simultaneously, whereas usually their timing was as separate acts, with a bit of overlap. My partner was coming up the path alongside the house, and stopped. It was like a Disney moment, with me and these other wild creatures all going about our business in perfect harmony. A peaceable kingdom, indeed. 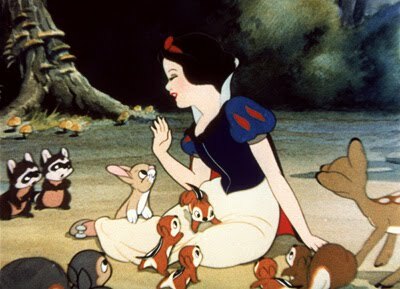 The bunnies were perhaps a couple of feet away from me, and the whole cast of characters surrounded me, as if I were a tree in their landscape. I talked softly to them. This went on for minutes and we shared a moment. Arslocii. I have always talked to animals; at a zoo, where a pacing wild cat would suddenly start purring and pressing its flank against the bars; to squirrels, many times admonishing them to stay out of harm’s way. In March, I was working in my community garden plot and was visited by a robin who, of course, was excited by the digging. I started talking to this robin, and when a huge worm would surface I would toss it over to Robin (let’s call him/her that). Every day after that, Robin would show up and serenade me, or call to me from a tree; then, upon hearing my voice, would hop over to greet me. My partner was digging in the plot one day and Robin showed up. After hearing the wrong voice, Robin flew away. I am an appreciator of squirrels, despite the fact that so many people see them as pests. 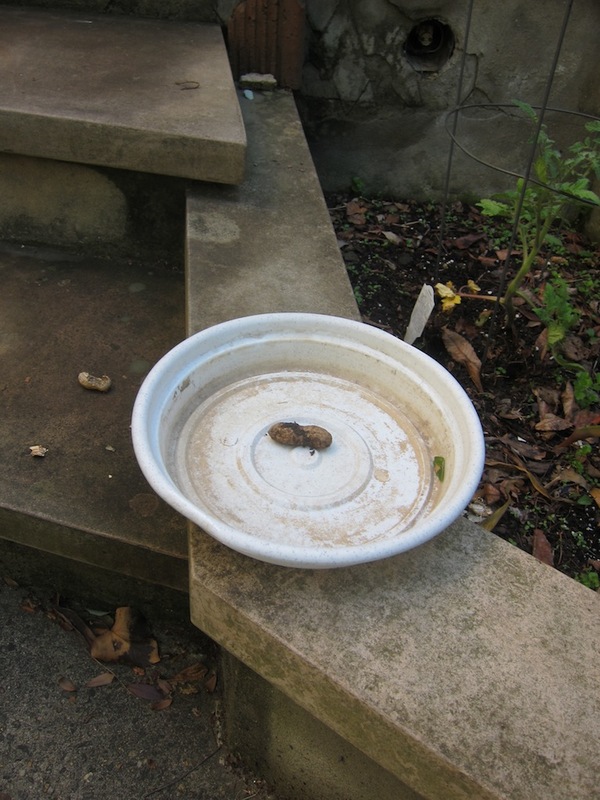 We have a small courtyard that is an oasis, if not an animal refuge, in a hard-surfaced city neighborhood. Squirrels come into our courtyard every day, sometimes to bury things, since we have one of the few breaks in the pervasive cement. One squirrel likes to eat the samaras on our paperbark maple tree. I don’t mind as long as the smaller branches don’t break, although they often do. To ameliorate the damage, I started setting out small fistfuls of peanuts in the shell. Since there is more than one squirrel, I am learning a lot about their differences. There is a huge chubby one that sits in the pile and scarfs down the nuts, scattering empty, broken shells every which way. There is a slimmer one who systematically buries all the nuts, maybe eating one or two, but leaving no trace that there ever were peanuts. I don’t put out nuts every day, maybe every few days. They all get taken, but I can tell who got them by what is left or not left behind. I have witnessed, lately, that if the fat guy got the nuts, the thin guy gets angry and kind of acts out, running around the courtyard and digging up some of the stored booty. I have talked to this particular squirrel and explained that there is more to come, just be patient. Yesterday, the overfed one’s thievery must have happened again because the thin squirrel was excavating previously stashed nuts. 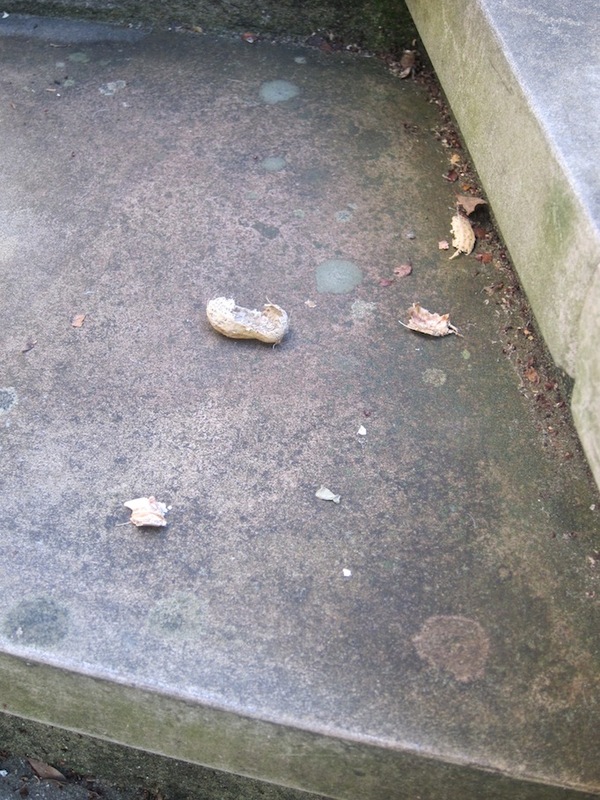 And, surprisingly, a few shells were left on my steps. But the peculiar thing was that, sitting in an empty plant tray on a low wall, there was a single peanut still in its shell and with telltale dirt marks from its burial. Mind you, I always pile the nuts far from the stairs and door, to give a sense of safety to the hungry diner. Was this squirrel telling me something, making an offering, or asking for more? This had never happened before. It was a sign. An interspecies communication, a breaking down of barriers, a placeness. It is a wonderful thing. And right in my own backyard.